A three-story, catalyst-architecture is emerging in Prinzessinnengarten as a physical platform for the Neighborhood Academy and other cultural and educational activities. 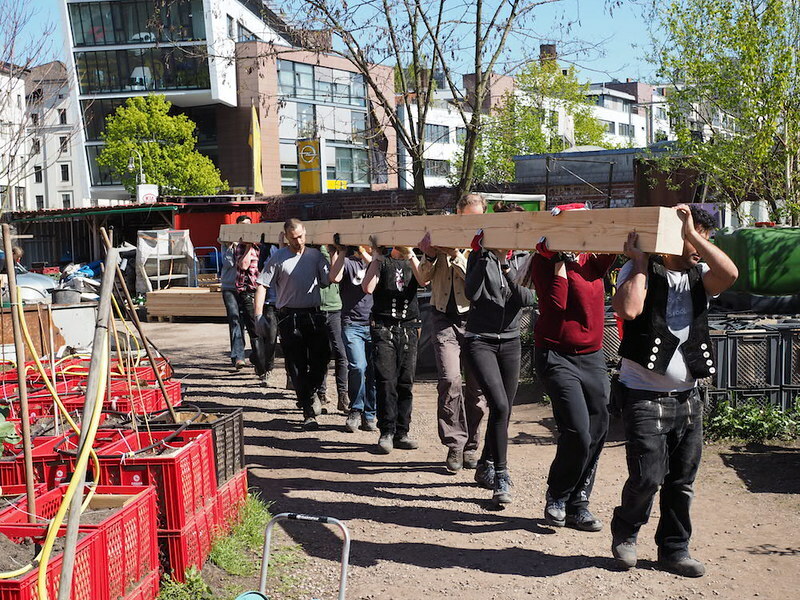 The experimental architecture will be build in a collective DIY-process together with volunteers, students and apprentices during the summer of 2016. The Arbour will create spaces for workshops, film-screenings and public discussions. Through a do-it-yourself practice, corresponding to the non-formal learning processes taking place in Prinzessinnengärten, the architecture provides an opportunity for a direct and experience-based introduction to a social practice of building that highlights connections between community, city, architecture and environment. With this architectural principle, the space of the garden will be expanded. The Arbour adds new rooms to the garden, opening up further possibilities for learning and community organizing. Moreover, the different activities of Prinzessinnengärten attain a further dimension of social and ecological visibility through the vertical green of the architecture. The idea of the Arbour has been developed by fatkoehl architects, Christian Burkhard (Architectuul), and Marco Clausen (Prinzessinnengärten / Nachbarschaftsakademie) since 2013.